Wallin & Klarich, A Law Corporation is proud to announce that the Southern California Defense Blog has been nominated for best legal blog of the year by The Expert Institute. The Southern California Defense Blog has been selected as one of the best blogs in the criminal defense law category in the annual contest by The Expert Institute. Now, the best legal blog will be awarded based on a voting system. Anyone can cast a vote for any of the nominees for the best legal blog by visiting the voting page on The Expert Institute’s website. The Southern California Defense Blog is a premier source of information regarding criminal defense topics and how they relate to southern California. 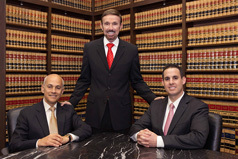 On the site, you can find the latest legal news, including new and updated laws, and advice from skilled criminal attorneys with more than 35 years of experience. Please help us earn the Southern California Defense Blog the recognition it deserves. Voting is underway now, and you can cast your vote for our blog. To vote, simply click here and you will be redirected to the voting page. Just verify that you are not a robot by checking the box, then click the “Vote” button. You can vote only once during the voting period. The voting period runs through Nov. 14 at 9 p.m. PT, so make sure to cast your vote before time runs out.